First, there’s direct current power, which is also referred to as DC. This is the type of power that you find in batteries, and it’s the same power that solar panels generate. However, DC energy on its own cannot be used to power your appliances, which is why you need an inverter. Because all the electrically powered appliances in your home use an alternating current (AC), you need an inverter to convert the DC energy stored in the solar panels into AC power that you can use. How does a grid-tied inverter work? Well, it basically converts DC power that’s stored in the solar panels into AC, after which it sends it to the grid in order to obtain credit. Now, there are literally only two parts involved in wiring a grid-tied inverter, the inverter itself and your solar panels, which is why they’re so simple and easy to install and use. There are some grid-tied units that come with batteries nowadays but they’re still a rare find. What about off-grid inverters, you ask? Off-grid inverters require a third component in order to function and that is a battery. First, the solar panels transfer energy that’s still in DC form to the batteries, which the inverter inverts into AC power that you can use for all your household appliances. In a way, this system is sort of like a mini power grid, and the best part is that the inverter won’t use up the power in your batteries as the solar panels will constantly charge your battery bank. Since they contain extra parts like a battery monitor, charge controller and AC/DC circuit breakers, off-grid inverters are significantly more complex than their grid-tied counterparts. Not only that, but you also have to account for the added off-grid equipment that you need to make the system work, including remote controls, surge suppressors, breakers and enclosures etc. We understand that some of this terminology might be a bit confusing at first, but you need to get used with it so that you can understand the following information. It’s going to help you make an informed purchase when the time comes for you to buy a converter. As soon as the sun hits the solar photovoltaic (PV) system, the electrons inside the solar cells shake about to create DC energy. Thanks to the circuits within those cells, enough energy is accumulated to power your home. Solar panels collect sunlight and convert it into energy, and once that energy has been sent to an inverter, it gets converted from DC energy to AC energy. In this form, solar energy has the capacity and ability to power all kinds of appliances around the house such as the kettle, stoves, hair dryers and other electronics. First off, consider the amount of power that you need to run your household. Determining the appropriate off-grid inverter size that’s right for your home is pretty simple and requires only that you make a list of all the appliances that you’ll be using around the house. Then, calculate the wattage of all the different appliances and lights put together to figure out how many watts your system will need to generate in order to power everything at once. Of course, you probably won’t have everything running at the same time, but aggregating everything like this is the best way to get the most out of your solar system. Remember to include the voltage that each appliance requires to run smoothly. The average appliance typically runs on 120Vac, whereas something as complex as a well pump might require up to 240Vac. We won’t go into how pure sine wave inverters work in this article, as that would require a whole other post. However, we can tell you that they provide a cleaner power output than a modified sine wave inverter. However, some people opt for modified sine wave inverters anyway because they’re a much cheaper option but they end up with low-quality power output as a result. Pure sine wave inverters, on the other hand, provide excellent quality power output that’s comparable to a power grid (and in some cases even better). Also, modified sine wave inverters have been known to negatively affect the performance of certain appliances like pumps, compressors and motors that just wear out quicker than they’re supposed to. It can also damage computers to the point of complete breakdown, while TVs and radios often end up with static background noise or develop poor audio and video quality. That’s why we highly recommend that customers go for pure sine wave inverters to avoid these and other problems. Even if you have to save a little more for them, it’s worth the wait because you know they’ll help extend the lifespan of your appliances. If you want to know what the difference is between a pure and modified sine wave inverter, simply look at its total harmonic distortion (THD) rating. This is usually written on the inverter’s spec sheet and tells you what the power quality output of the inverter is. Efficiency – This basically refers to the maximum amount of battery power that the inverter will be able to deliver to your home appliances. Ideally, you want your inverter to have a maximum efficiency rating of 94% to 96%. Self-Consumption or No-Load Current Draw – Even when it’s sitting on standby, your inverter will continue to consume power. For the best results, make sure you go for an inverter that has low power requirements. Surge Capacity – No matter how efficient your system is, short-term overloads can happen. You need an inverter that has a high surge capacity so that it doesn’t trip when this happens. Also keep in mind that certain appliances like the fridge require up to 3x of their normal energy requirement to even power up. 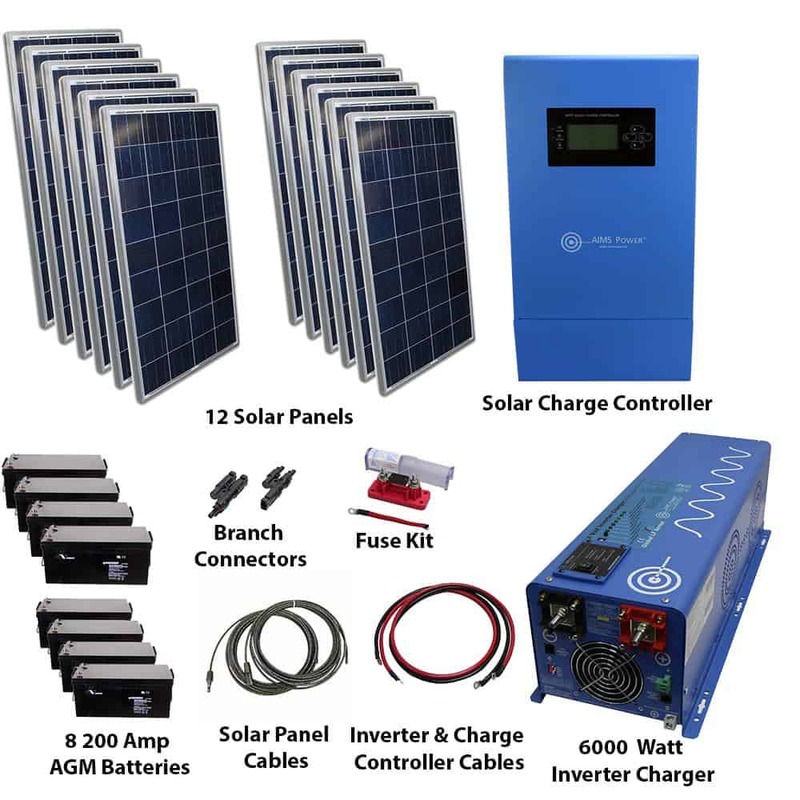 Battery Charger Output – A thoughtfully designed off-grid inverter should come with its own battery charger that you can use along with a backup generator to keep the lights on during the cold winter months. The battery charger for a solid quality off-grid inverter will have a rating of about 50-100 amps DC to keep you going. Temperature Range – Whatever you do, don’t store your inverter in an area that experiences extreme temperatures because they are very sensitive to extreme heat. Warranty – The standard warranty period for an inverter starts at one year, but this can go up to 3, 5 and even 10 years if the manufacturer is willing to provide an extension. If you want to find out how your inverter measures up based on the above mentioned technical specs, simply look at the product’s spec sheets, or consult with a specialized solar technician to help you choose a good quality inverter. 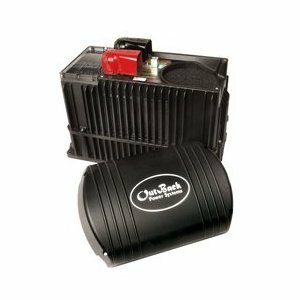 Battery Charger – This will keep your system running even when there’s no sun for your solar panels to draw energy from. These can also double as inverters when needed, and they work by drawing power from a backup AC generator. Grid-Tied Capability – If you’re considering a grid-tied setup with backup battery power, then it might be worth it to consider a grid-tied inverter with the ability to send power to a central grid. Automatic Generator Start – While this particular function comes as a standard feature of some inverters and charge controllers, yours might require one that comes as an extra attachment. Read Up on the Manufacturer – To make sure that the product you’re purchasing is of high quality, do your research on the manufacturer and find out what kind of reputation they have. At the end of the day, inverters are a long-term investment that you should purchase from a reliable manufacturer. For the purposes of code compliance and safety, off-grid inverters need to be certified according to the law. For example, home inverters require a UL 1741 listing, while boat and RV owners need to carry a UL 458 for their mobile inverters. Inverters that are used for emergency purposes require a KKK-A-1822E certification, and you’ll need a UL 1778 in order to enjoy uninterruptible power supply. If you’re outside of the US in a place like Canada, you’ll need to have a CSA 107.1 standard certification, and for those outside of North America, there’s the IEEE 1547 standard certification which is internationally recognized. As with anything that you purchase, the price will play a huge role in the type of inverter that you choose, and of course, you get what you pay for. Oftentimes, the pricier a model is the more features it has. Also consider the price of the components required when installing the entire system, including circuit breakers, mounting plate, remote control etc., and don’t be afraid to shop around to compare prices too! A solar inverter is designed similarly to a LEGO toy and it comes with different pieces that need to be put together to make it work. Also, they’re designed so that you can attach them to a certain amount of solar boards, and these solar boards usually cost 90% more than the inverter itself. Unlike your solar panels, which can last for up to 25 years, inverters are designed according to the principles of planned nascence, which means that they’ll have to be replaced after a predetermined number of years. To get the most out of your solar inverter, be sure to plug it into the right quality and quantity of solar panels. If you connect it to more or less solar panels than required, it may malfunction or simply fail to perform at its highest capacity. For the best results, make sure that you inverter stays connected to about 95% of the solar panels that it’s supposed to be hooked up on at any single time. As the name implies, standalone inverters work regardless of whether or not they’re connected to a solar panel. They’re able to source power in DC form from photovoltaic (PV) batteries, wind turbines, hydro turbines, and engine generators. The market is flooded with standalone inverters, and it’s probably because unlike their tied-up counterparts, they don’t need anti-islanding protection. Also, they work constantly to integrate vital battery charges, which help keep the AC battery charged up. Grid-tied inverters work together with a utility charged sine wave and are an ideal option if you want to power your home with a utility grid that will let you benefit from net metering. On the other hand, grid-tied inverters are designed to automatically switch off whenever there’s a power cut, which pretty much makes them useless in times of emergency. If you’re considering this option, keep in mind that grid-tied inverter systems require anti-islanding protection. A grid-tied inverter is said to experience islanding when it functions as though the utility grid is functioning even when it isn’t. This usually happens when the electrical system has resonating load circuits. A battery backup inverter works by siphoning energy from the batteries using the onboard charger to manage that energy charge, and then delivers the excess energy to your utility grid. You can use these to deliver AC power to specific areas during power outages. Also, they require anti-islanding protection when you install them as well. Solar inverters are an important component for your solar power system and are vital to ensuring that everything runs like a well-oiled machine. Below we’ve listed a few of what we consider to be the best inverters available on the market, as well as the pros and cons of each so that you can make an informed decision. 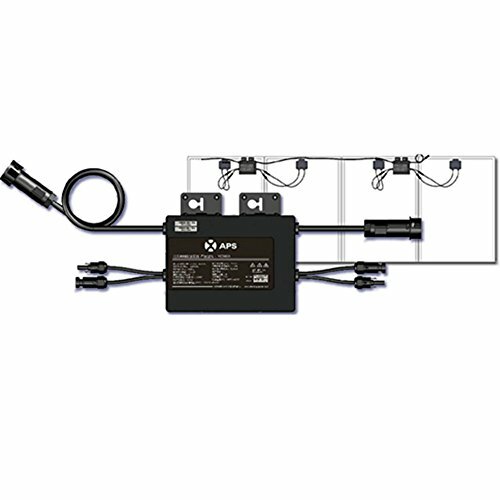 This efficient micro-inverter from APS boasts features like integrated ground and a highly capable trunk cable. Although small, this unit has the capacity to handle a sequence of 16 solar modules with a 20A breaker. Plus, it has an impressive power output that can reach up to 500W. All in all, this APS YC500A Micro-Inverter definitely lives up to the phrase “dynamite comes in small packages.” It is ideally suited for modules from 280 to 310W. 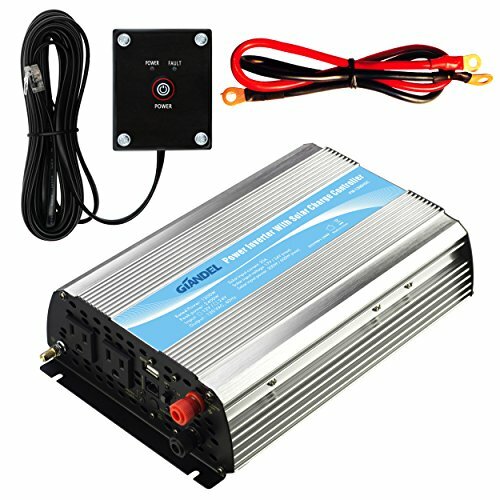 If you’re shopping on a budget but you still want a good quality inverter, this is it. Designed by Australia’s leading inverter manufacturer GIANDEL, this inverter comes with dual AC outlets and a convenient USB charging port. It’s designed in a way that the input and output spots are isolated, which makes it really safe to install and keep. You can use this to power up your laptop, a few lights, some power tools etc., at the same time without it tripping. 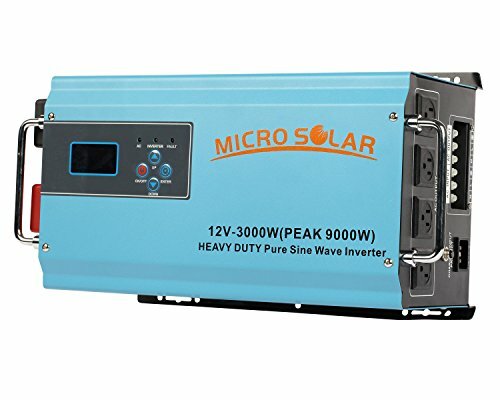 This well-built MicroSolar 12V 3000W Heavy Duty Inverter effortlessly connects to your panels to provide 92% conversion efficiency. Sure, it’s large and clunky, but that’s what makes it so tough, and it’s backed by a 1-year warranty and a 6-month free replacement. Note: Induction motors such as air conditioners, refrigerators, freezers, microwave ovens, and pumps may have a startup surge of 3 to 7 times the continuous rating. Heat generating appliances such as hair dryers and water heaters will have high peak surges as well. Example: If the microwave oven has peak surge which is 4 times the continuous wattage, the 1200 Watt continuous microwave ovens will have 4 x 1200 Watts = 4800 Watts peak surge. The recommended inverter to run 1200 Watt continuous and 4800 Watt peak surge microwave is 2500/5000 Watt inverter or larger. Support small air conditioner, small microwave, laser printer. Weight 18kg/39.7lb Shipping Weight 20.5kg/45.1lb Package Dimensions 52.5*34.5*29.5cm/20.7*13.6*11.6inch. Power consumption: Almost ZERO when turn OFF. No Load Power consumption <30W. Now, if you’re on the market for a really sturdy, powerful and capable inverter that will last you for years, look no further than this 600W unit from AIMS. With a peak power capacity of 18000 watt, it only makes sense that this inverter features an industrial/ marine grade frame. We also love that it’s packed with useful features, like settings to let you choose the battery type, auto gen start, a charge controller and even a built-in smart battery charge. It has the flexibility to pull from batteries first with the main power line as a backup or pull from the main power line with battery backup with a simple dip switch. The unit is designed to hold batteries, sub-panel and all necessary switching and wiring with minimal re-routing of existing branch circuits, so it’s fairly easy to install. This particular inverter yields high wattage for when you want to power several appliances and lights in your home at the same time. The inverter/charger is modularly expandable and stackable when used with option OutBack HUB and MATE charge controllers, which are sold separately. The modular and stackable design allows up to 10 inverters to be connected in a grid-tie system. With the new Outback Power FX-R Renewable Hybrid inverters, you’re no longer forced to use only one type of electrical system. Traditionally, most inverters are designed to work as either grid-interactive power systems or off-grid systems. Outback has changed the rules and developed a single inverter that’s capable of both. All you have to do is simply reprogram the inverter’s connectivity settings. It offers high operating efficiency and it’s available in vented VFX and sealed FX versions within M-Series. The value of the sealed version is keeping out pests and dirt, while the value of vented one is higher continuous power output. It has corrosion resistant internal components and bug proof chassis which makes it ideal for hot and humid areas. You don’t have to worry about mosquitos messing with your power supply during hot weather conditions. The device is UL458 certified and backed by a standard 5-Year warranty. The popularity of this brand can be attributed to the unique design that uses DC optimisers which enable individual panel level monitoring and control. This new generation of inverters features advanced digital processors and thin-film capacitors to produce a clean AC output with a significant reduction of heat losses. HD-Wave technology inverters are half the size and weight of the previous generation and raise the CEC efficiency up to record-breaking 99%. 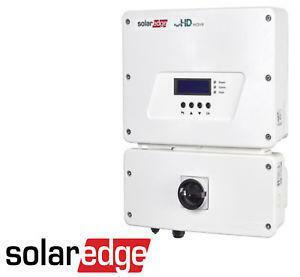 The reason why Solaredge was able to produce such a small and efficient inverter LIES in the fact that all Solaredge inverters must be installed in combination with the DC optimisers which perform part of the job of a common string inverter. 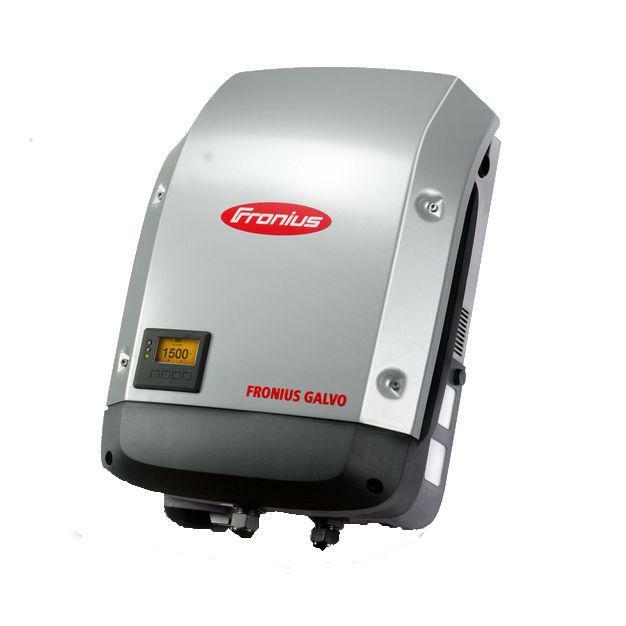 Fronius Galvo is especially suitable for self-consumption systems, and with its power categories ranging from 1.5 to 3.1 kW it is perfect for households. The integrated energy management relay allows the self-consumption component to be maximised. It also offers other smart features, such as the simple connection to the internet by WLAN, the integrated data logging, or the plug-in card technology for retrofitting additional functions. A free solar web smartphone app is also available for android of iOS. The Fronius Galvo provides an extra wide voltage window allowing for immense flexibility in string design and it is suitable for all module technologies due to galvanic isolation. On top of that, the new hinged system allows very quick and easy installation, while the unique snap-in design makes servicing and maintenance very simple. 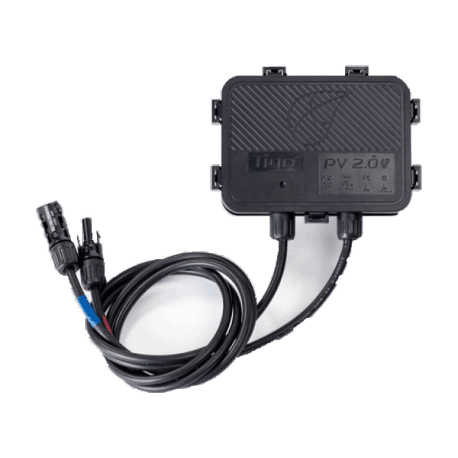 With its high protection class IP 65, the unit is designed both for indoor and outdoor mounting. Compared to the previous generation of Sunny Boy inverters, the SMA 7.7-US inverter features several improvements including a wider voltage input window, direct smartphone access and a Secure Power Supply, and three independent MPPT inputs. 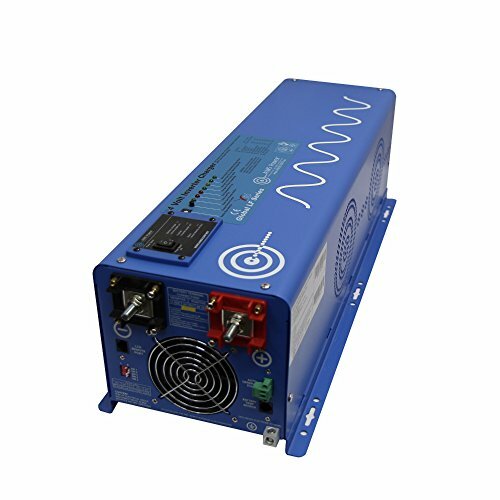 Due to industry-leading 100 volts DC minimum system voltage, the 7.7-US inverter will work with shorter PV strings and produce more power. This inverter includes three independent MPPT which improves efficiency and flexibility. It also features an integrated DC disconnect switch with each inverter, which makes the installation more simple and easy. The smart design of this inverter features two-part enclosure concept, allowing simple, expedited maintenance and servicing. The combination of three MPPT inputs, Secure Power Supply, direct smartphone access and integrated DC disconnect make this one of the most cost-effective inverters available. Transformerless, 240V or 208V AC Output. Gray Lid. AFCI & Secure Power Supply capable. 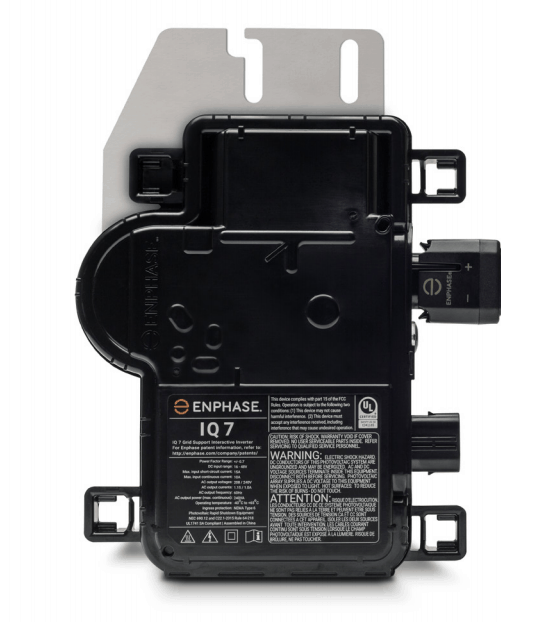 Enphase energy is known for high-quality microinverters and is widely considered as the global leader in microinverter technology and the company’s seventh generation microinverter, the Enphase IQ 7 series, is suited to residential applications and commercial systems. Unlike single string inverters that work with multiple solar panels, these super small and effective inverters work on a per-panel level. It has the maximum output power of 250 VA and provides peak CEC efficiency of 97.6 %. 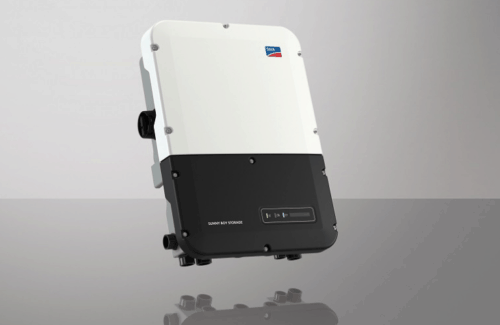 This inverter is optimized for 60-cell panels of up to 350 watts. With this innovative Tigo TS4-RV platform, you can equip every single PV module selectively with an additional function, which allow for individual panel level monitoring and power optimisation. This system prevents shaded solar panels to drag the entire array down, thus saving the energy. If you want to achieve higher energy yields and system costs reduction, these optimizers are the right choice for you. Tigo Energy offers three types of optimizers; Tigo TS-4R-M (Allows monitoring to be added to individual modules, while transmitting data via WLAn), Tigo TS-4R-S (provides the necessary safety and monitoring services), Tigo TS-4R-O (provides module level optimisation into one seamless unit). The Tigo uses a very clever concept known as “impedance matching“, which helps improve the collection of power from the array as a whole. Tigo Energy optimizers are compatible with most inverters on the market. With the right solar inverter, you can enjoy a smooth functioning and powerful solar power system that won’t trip due to overuse, and will come in handy during emergency power outage situations. As mentioned above, you want a solar inverter that comes at a good price point with all the right features and specs. Of the inverters we reviewed above, we believe that the GIANDEL Power Inverteris the one with the right combination of power, ease of use and installation, as well as a good balance of features. It boasts 12000Watts of power, two AC outlets, a dedicated USB charging port, as well as isolated input and output spots.